Business development companies ("BDCs") are special investment vehicles designed to facilitate capital formation for small and middle-market companies. BDCs elect to be subject to certain provisions of the 1940 Act and benefit from favorable tax treatment. Given the dislocations caused by the financial crisis, BDCs are playing an increasingly significant role as providers of capital to small and emerging companies that may not be able to obtain bank financing or do so at attractive levels. 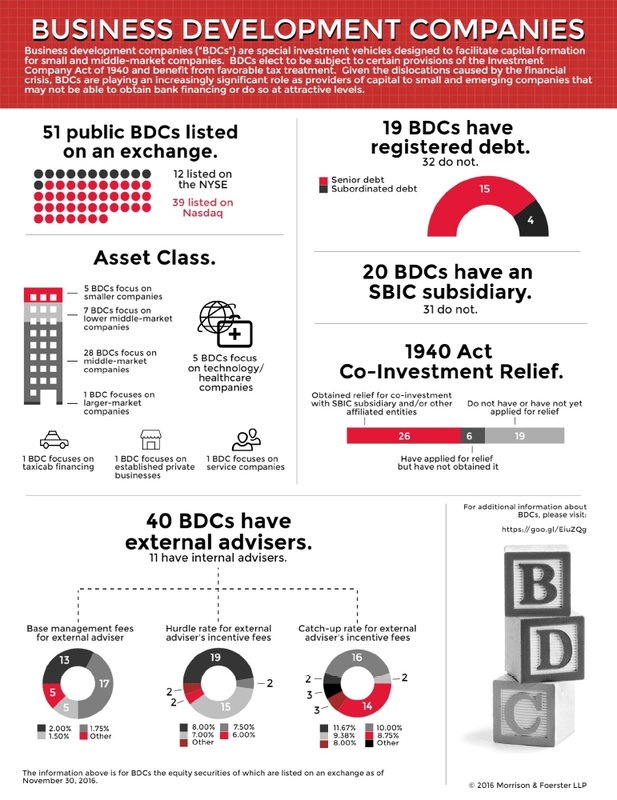 Morrison & Foerster's leading securities practice, combined with our knowledge of the 1940 Act, the Advisers Act and the tax considerations applicable to BDCs, make us a regular choice for private equity and other sponsors of BDCs and for the underwriters and advisers to BDCs. Morrison & Foerster has for decades been known as a leading firm advising issuers and underwriters on initial public offerings. Given our depth of capital markets experience, and our expertise in some of the most active industries for offerings, we are a key partner for issuers transitioning to public ownership. With our tax and investment management colleagues, we assist sponsors, management and boards of directors in structuring and forming their BDCs. We help our clients to anticipate potential accounting and regulatory issues; plan the company's financing strategy several steps beyond the IPO; structure intercompany relationships; adopt the requisite compliance policies and procedures; obtain requisite exemptive relief; and, of course, draft disclosure. Given our roots in Silicon Valley, we are committed to emerging companies, and have championed many of the reforms that made their way into the JOBS Act. Once the JOBS Act was enacted, we promptly launched various dedicated JOBS Act resources. We regularly represent issuers, underwriters and placement agents in all aspects of equity capital markets transactions, including advising on public (IPO and follow-on) and private offerings, including confidentially marketed public offerings, at-the-market offerings, shelf offerings, private placements of equity securities and PIPE transactions. We also are one of the preeminent firms advising on debt issuances. We advise clients on a full range of disclosure, governance and regulatory matters relating to the federal securities laws, including the 1940 Act and the Advisers Act. We prepare registration documents, and help our clients in all phases of their operations, including disclosure, compliance, risk management, record-keeping, and oversight by independent directors. We also advise BDCs on best practices regarding compliance policies and procedures. In addition, we provide practical advice on matters relating to capital structure, including compliance with the asset coverage test, the issuance of securities below net asset value, transactions with affiliates, the valuation of securities, social media and related matters. Our financial transactions group and our bankruptcy and restructuring group also provide support for our BDC clients. Our financial transactions group works with BDCs to negotiate and establish credit facilities. We also have extensive experience structuring and negotiating investments in BDC portfolio companies. This includes first and second lien loans, unitranche and other first out/last out loans, covenant-lite loans, PIK debt, subordinated loans, debtor-in-possession loans, high-yield debt securities, convertible debt, preferred equity and other mezzanine financings. Our bankruptcy and restructuring group advises BDCs and other lenders in connection with distressed investments, including restructurings, out-of-court workouts, foreclosures and bankruptcy proceedings. Finally, our tax department is an integral part of the Morrison & Foerster team advising BDCs. As such, the tax team focuses on creating the most tax efficient structure depending on the facts and circumstances of any particular BDC or company looking to become a BDC. Our tax department has significant experience with both private and public BDCs. In addition, members of our tax team have decades worth of experience with the taxation of regulated investment companies that are eligible for favorable tax treatment. This experience is of particular significance to public BDCs since they typically elect to be treated as regulated investment companies.